As a reader, I had to admit that Christian romance or Inspirational Romances are not normally my thing. So when the opportunity to do a dare to read specific genres came out on Goodreads, I decided to take advantage of it to broaden my horizons. 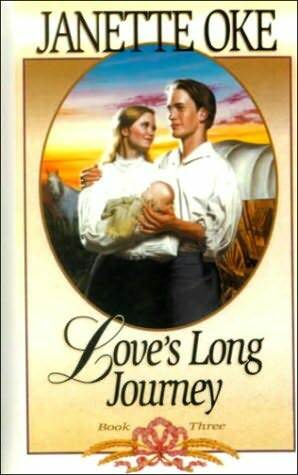 This is the third book in the Love Come’s Softly series by Janette Oke and for never having read any of the others in the series, I had no problems understanding what was going on. The novel chronicles the travels of Melissa (Missy) and Willie on their journey west in a Wagon Train and the trials that they faced along the way and after they are settled on their new homestead. I enjoyed the story and getting a closer view of what the original settlers out west had to face as they travelled away from what they knew. The one distracter for me in the novel was the dialogue. While I know that the author was striving for accuracy in how people talked, it was a bit disconcerting with words such as ‘iffen being used, although it did lend believability to the story. Recommended For: People who read religious romance, who might want a short sweet read with no real sexual tension or something for teenagers who are just starting to read romance. Right now, I don’t know if I would seek out any more of her books, but it is an option in the future.